William Cuningham's "Coelifer Atlas" from The Cosmographical Glasse. London: John Day, 1559. This illustration from William Cuningham's The Cosmographical Glasse (1559) represents Ptolemy's conception of the universe. 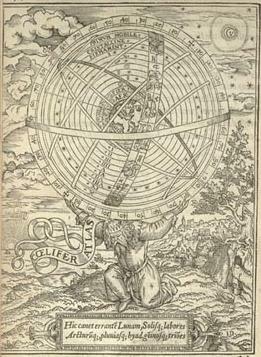 Atlas, dressed like an ancient king, bears on his shoulders an armillary sphere representing the universe. In the center of the sphere is earth, made up of the elements of earth and water. Surrounding the earth are two more elemental spheres, for air and for fire. Other bands represent the spheres of the planets, the firmament of fixed stars, the crystalline sphere, the primum mobile, and the signs of the zodiac. Below Atlas are lines on cosmological themes from Virgil's Aeneid.